Kevin Graham appears on “Chicago Tonight” on Feb. 7, 2019. 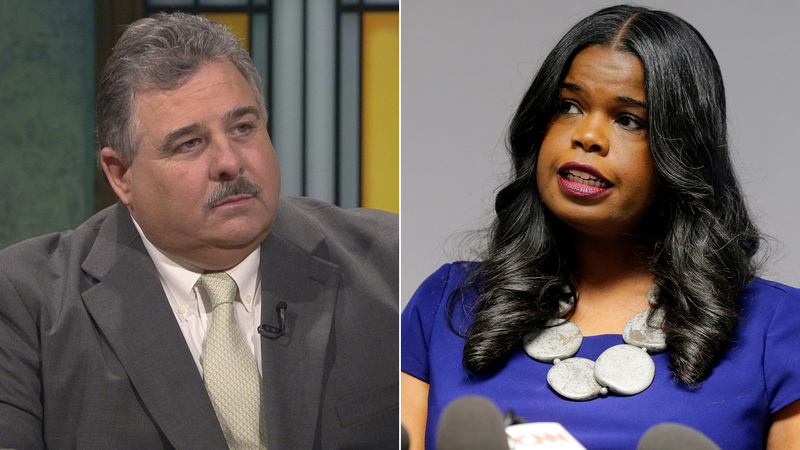 The head of the Chicago Fraternal Order of Police joined chiefs from several suburban police departments in calling for Cook County State’s Attorney Kim Foxx to step down following her office’s handling of the Jussie Smollett prosecution. “Ms. Foxx needs to resign and she should do it quickly,” Chicago FOP President Kevin Graham said during a press conference Thursday afternoon. Already this month, groups of suburban police chiefs have issued a vote of no confidence in Foxx after her office decided to drop more than a dozen felony disorderly conduct charges against Smollett. Smollett told police he’d been beaten by two men who were yelling racist and homophobic slurs at him in the early morning hours of Jan. 29 in the Streeterville neighborhood on Chicago’s Near North Side. But investigators eventually determined Smollett had paid two brothers $3,500 to stage the attack in an effort to raise his own public profile. Earlier this month, a grand jury indicted him on 16 additional counts of disorderly conduct for filing a false police report, all stemming from the alleged hoax attack. Smollett, 36, has maintained his innocence throughout the investigation, telling reporters last week he’s “been truthful and consistent on every single level since day one.” Prosecutors believe the actor did orchestrate the attack and insist they only dropped the charges as part of an “alternative prosecution” because Smollett is a first-time offender facing a low-level felony charge. That decision has led to a firestorm of criticism directed at Foxx. She recused herself from the case, but not her entire office, after asking Chicago Police Department Superintendent Eddie Johnson to turn his investigation over to the FBI following conversations with Smollett’s family and representatives. Foxx said the actor was still considered the victim of an attack when she made that request. The FOP last month called for a federal investigation into Foxx, alleging she interfered with the investigation into the “Empire” star’s case. Graham on Thursday said he believes that process is moving forward. Foxx has said she would welcome an outside investigation into her handling of the Smollett case. But she said Thursday she has no intention of stepping down.